Moorpark, CA. The first time is not always the best, but it is often the most revealing. The first time I saw Casablanca I brought a borrowed memory of seeing it. “Here’s looking at you, kid” fell on my ears with warm and comforting familiarity, but the movie startled me with lines that I’ve not since forgotten. Rick, in the throes of passionate new love, asks Ilsa, “Who are you really? And what were you before?” Struck immediately by the many layers of these simple questions, I’ve never really stopped asking them. Rick knew precious little about his lover. He loved her before he knew her “really,” but he loved her nonetheless. There was more to Ilsa than Rick could see immediately and there was, potentially, a great journey (perhaps a disillusioning journey) in the discovery of the real woman. Interestingly, Rick moved from a subject “who” to an object “what.” Make what you will of this transition from the subject immediately present, to the distant object of the past, but clearly Rick was interested in the past only as a means to understand his beloved Ilsa. The questions are much more interesting when we apply them to Rick’s life. Who is Rick, really? What was he before? We first meet Rick the cynical businessman—an exaggerated version of a species: American capitalist. He has no heart, no compassion, no romance. “You are a very cynical person,” Rick is told by the amoral and cowardly Ugarte. This cynical American businessman is also very successful, with business competitors trying to buy the most popular bar in Casablanca, revealingly named “Rick’s Café Americain”—“everybody comes to Rick’s.” Cold and cynical, Rick is still loved by women who should know better than to get involved with such a man. Is this the real Rick? He tries to make people think so. Emotionless, he constantly emphasizes his splendid isolation from feelings, politics, ideas. Unwilling to declare allegiance to anything but himself, he isn’t an American, he is a “drunkard”(“that makes Rick a citizen of the world.”). He has no interest in politics—the problems of the world are not in his department. We learn from the beginning, however, that Rick is fooling himself mainly. Those who know anything of his past know that, in the words of Captain Renault, “under that cynical shell you’re at heart a sentimentalist.” Spurned by a woman, Rick was hiding from himself, trying to hate the woman he loved and reject his own past, which he had lived in devotion to the cause of liberty (we learn about his assistance to those fighting tyranny in Spain and Ethiopia). When the love of his life enters Rick’s Café Americain and reenters Rick’s tortured life she does so as the wife of a courageous, charismatic, and famous freedom fighter, Victor Laszlo. Face to face again with Ilsa, Rick struggles to remain faithful to his newly crafted cynical identity, struggling to hate the woman he loves. 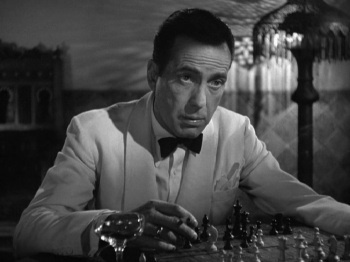 In 1942, the year Casablanca was released, Rick personified well a deeply held belief about American identity, an image that many Americans had of themselves and their nation. Or perhaps it is more accurate to say that this movie helped explain to Americans how and why they ought to participate in a dangerous world. Following the nation’s first venture into idealistic imperialism, World War I, claims abounded about the insidious role of powerful business interests in involving the United States in a European conflict—fears that American idealism was in rhetorical service of the most crass business interests. The two decades that separated history’s two bloodiest events—the two world wars–witnessed a nation largely devoted to returning to the “business” of America, an America that lived in the imagination of its citizens in a sort of benign separation from the rest of the world. In World War II Americans learned with Rick that “isolationism is no longer a practical policy.” But much more profoundly, Americans discovered a role to play in the world that fit their most highfalutin ideals: that all humans deserve freedom, that self-determination and self-rule (i.e., democracy) is the only morally defensible government, and that certain rights are human and therefore universal. Moreover they came to believe that these universal truths were first encoded into a political regime by the United States. Being the first placed a peculiar burden on America. Rick was a product of a certain historical confluence, a confluence that influences the American sense of purpose to this day. America was not only the nation to inaugurate the new order of the ages, grounded on universal claims about human nature and rights (Declaration of Independence), but now the most powerful nation on earth, capable of fulfilling its mission to history by defending, across the globe, the ideals not of America but of humankind. America may err and falter, its motives might be mixed, but in the long run such a combination of truth and power produces a compelling and dangerously deceptive humility—for we are servants of some larger (perhaps even divine) purpose and our goals are in the best interest of the world, of humankind. We seek, as Woodrow Wilson noted in World War I, no land, no concessions, no spoils of victory, just the fruit that comes from an increasingly free world. This narrative of America does not belong to either the left or the right, to Democrats or Republicans. They all have found in this story their own ideals and the justifications for their policies. Within their ranks have been those who have challenged this story, sometimes radically, but most often by suggesting a more complicated history and national identity (along with warnings that even truths can be dangerous when stripped of their complexity). The heated debates of the past sixty years or more have always included claims to who we are and what we were before—often with political and ideological opponents drafting for their side the same documents, the same historical figures, the same seminal historical events. In the best of times, Americans hear and tell many subtly different stories, a substantial array of interpretations. They inhabit a richly textured narrative structure that allows individuals to find within a broadly recognized consensus their own place in this story and that allows them to participate authentically in the various institutions and events that make up public life. In the worst of times Americans seem caught between two opposing and often cartoonish narratives and, lacking the more diverse array of options, must vote in favor of one, learn history in favor of one, use the charged language in support of one. In this sense, we live in the worst of times. Rick’s story emerged during history’s greatest world conflict and in this context expressed and fostered an American identity that drew from a rich stock of American images and ideals. It was a useful identity and, I think, an authentic one. More than that, I think Rick still personifies an enduring expression of America in the world. But Rick isn’t the only possible or authentic American self, for we have a rich, multi-vocal history that incessantly confronts a changing environment, highlighting bits of the past and throwing those “objects” of our identity open for fresh and often competing interpretations. The “what” we were before is always shaping the “who” we are, but necessarily through a confrontation with ever new circumstances. Our present circumstances—end of the cold war, war against terrorism, globalization, rise of a certain species of capitalism, growing cultural alienation with Europe, ever more heated debates about acceptable forms of individual liberty, high-profile claims to a cultural divide—require a subtle and complex appropriation of our past. Equally important, we need to find a way to transcend the rhetorical dualism that presently shapes our public discourse—red state v blue state; conservative v. liberal. While it is almost certainly the case that Americans are not polarized over the public issues of our day (as is presumed by most political commentators), the public discourse available to us creates confrontations, leaving us with a language that fosters almost comically simplistic ideologies. As a result, the expressions of the American self from which most of us have to choose are reductive and inauthentic—stick figures that create contempt and, sometimes, self-loathing. The United States is not a folk. Bloodlines have no meaningful connection to our real or imagined history. Our origins aren’t lost in some pre-literate age populated with mythical heroes and barely remembered battles. We have a creation story, a national beginning rich with statements about purpose and design, full of expressions about why the founders created this new nation. So self-conscious about their purposes or justifications were these men that they declared, to a listening world, their reasons for rebellion as well as the moral justifications for their republic, and, by extension, they defined the universal principles of regime legitimacy. For all the blood, toil, and sacrifice of the American Revolution, in some important respects, this nation was written into existence. Its complex pattern of myths issue from these words, or are tangled up in these words, expressed with beautiful ambiguity in this great historical moment. Americans are people of the text. With a canon that enjoys surprising, even amazing, consensus, Americans struggle to define their collective identity with continuous references to canonical texts. Americans fight endlessly over interpretations, over historical context, over original intent, over the real meanings of those authoritative texts. We are, I think, a fortunate people in two respects. First, because almost all Americans accept the canon, our struggles over meaning prevent us from taking seriously any challenge to the legitimacy of the republic. Second, the rich and tension-filled nature of the American canon allows us to rethink who we are in flexible ways, incorporating evolving traditions and patterns into new circumstances. In short, we are a nation with a history that supports continuous conversation about who we are. Each new generation gets to participate in the great conversation of the republic. But if America supports many myths, which myth is true? By myth I mean a narrative that explains the essence of the nation, a collection of stories, exemplary characters, sacred texts, and interpretations that give a meaningful unity to an otherwise heterogeneous people. Myths are necessary creations, helping make sense of our participation in a nation, fostering the necessary affection for one’s country, and tutoring those who inhabit the myth on how to be citizens. For one citizen, inhabiting a fairly prevalent myth, the United States is a secular nation dedicated to the liberation of each individual to think freely, to act according to her own desires, and to foster a decent equality. For another citizen, inhabiting yet another American myth, America is a Christian nation, dedicated to defending basic freedoms while supporting a complex and delicate social order that provides the necessary moral and character formation for realizing the goods of a free society. Whose myth do we choose? There are many false myths–stories not rooted in historical experience. It does not follow, however, that because there are false myths that there is a single true myth. Indeed, the hardening of myth about “what America stands for” into an ideology is a much greater danger to the American republic than false myths. Ideologies are narrow and programmatic. Ideologues speak in slogans, seek uniformity, and are incapable of engaging in meaningful conversation. The good news is that Americans have inherited a very rich patrimony, a heritage too complex and flexible to be held hostage for long by the ideologues. The bad news is that our current public discourse is dominated by ideologues, their slogans, and the narrow universalism of all ideologies. We don’t have to accept either the impoverished public discourse of our time or the narrow options available by that discourse. We need not be trapped by the dualism of red and blue state, of liberal and conservative, of pro-life and pro-choice, of secular or Christian nation. We can re-energize the American conversation, asking basic questions: Who are we, really? What were we before? It matters how we ask these questions. We can ask them with the aim of constructing a final, comprehensive, and question-ending dogma. This is the ideologue’s approach, except that the question asked is really not asked and the inquiry undertaken is not really inquiry. The ideologue begins with the dogma and searches for confirming evidence. The ideologue is interested in propaganda rather than conversation. The great virtue of an ideologue is that, having settled the hardest political questions, he is armed for action. An ideologue is prepared to change things, to adjust the world as he finds it to the world as he imagines it should be. While all participants in a democracy are ready to acknowledge the importance of being able to act, to make changes, to get things done, the ideologue is hampered by being unable to understand the views of those with whom he disagrees. He is unwilling to compromise and is therefore unfit for democracy. If we take the questions seriously, feel bound to follow evidence, and recognize the complex and developing nature of the subject, we can expect meaningful but non-dogmatic answers. By taking the questions seriously I mean nothing more substantial than beginning the inquiry without the support of certainty. But there is a basic claim that I think is corollary to this openness to inquiry, and more important. In its most extreme form we might call this a dogmatic anti-dogmatism. At its worst, this attitude toward inquiry can be purposeless, turned into a species of sophistry that is unable to form beliefs substantial enough to provoke action or that expresses itself with a debilitating irony. At its best, however, this attitude produces beliefs that inspire deep passion but without an accompanying ideological hubris. At its best, this attitude produces people who hold beliefs dear about American values and American heritage while being able to understand well the beliefs of those who disagree. Conversation is the antidote to ideology and an art most central to a healthy democracy. Alexander Hamilton asked a defining question of the American founding, and for each generation hence: “whether societies of men are really capable or not of establishing good government from reflection and choice, or whether they are forever destined to depend for their political constitutions on accident and choice.” (Federalist #1, italics added.) If we are to reflect and choose, if we are to deliberate about both means and purposes, then the art of conversation is one of the great and necessary gifts to hand to each new generation. It is, indeed, an art and since it is an art rather than a natural attribute, it must be taught. The art of political conversation requires that people understand that at some level they bear a responsibility to participate in collective decisions. Historically, most societies have neither accepted nor encouraged this responsibility among their members. America would be different, in the van of a new order of ages characterized by self-rule. But to participate is also to hear, to learn, to alter, to compromise—to think together about what we should do. This deliberation, this reflection and choice, is impossible unless the process has no determined conclusions, no ineluctable destiny. Conversations are like democracies—they are open to possibilities rather than predetermined by some abstract end or conclusion. People bring to conversations their beliefs and dispositions, inherited assumptions, as well as questions and doubts. Unlike arguments or debates, conversations rarely focus on abstract principles, tending instead toward particular examples, existing things, and personal experiences. Conversations are often about sharing things and therefore they serve to connect people together in a web of different but shared experiences. They are not about agreement as much as understanding, but in political contexts, where conversations are part of a deliberative process, they often produce consensus without agreement. In so doing, conversations reaffirm the legitimacy of the enterprise for those whose views did not triumph–political conversations require not only an openness of spirit but a diversity of views. Shared beliefs about this process, and the spirit that animates it, are indispensable to healthy self-rule. Our contemporary debates over some combination of reform, recovery, and preservation, concern our near future—and it is the near future that most of us hope to live up to who we are really. But there is no authentic national self except that it has a real and understandable history. Frankly I suspect that his cynicism more than his “enlightenment” is precisely what has kept Ric appealing to audiences as time goes by. In some ways his demeanor at the beginning is reminiscent of, perhaps, the Outsider of Camus. No pretenses. In any event, I’d emphasize that only relative to the demented busybody-interventionist yardstick of modern America could Ric at the beginning of the story be deemed amoral. Note that Ric’s not promising to pick up his rifle and remake the world so that nobody anywhere on the planet ever buys or sells a human being again. He’s just saying *he* himself refuses to do this. I daresay the conventional wisdom of contemporary America would actually consider this is a shameful abdication of responsibility. Merely looking out for your employees (and a screwed-up French girl) and treating them like human beings doesn’t cut it morally, from the perspective of would-be democratic revolutionaries. I’d point out that it does not follow that just because there’s a multiplicity of ways (i.e., myths) of looking at the truth does not free us from the problem that some myths are mutually exclusive. Just one example: If one person believes the Constitution exists to put firm limits, boundaries, and fetters on the US gov’t, while another person believes the Constitution’s rightful telos is to empower the US gov’t in its mission to further individuals’ rights ad infinitum… well, the question then arises as to what we mean by “we”. JD, I never called Rick amoral, nor did I mean to imply such. Ugarte is amoral. But the Rick that I find is presenting a cynical front and he is described, variously, as cynical or someone who has a cynical shell. It is the latter characterization that I think is more important because it allows one to apply the questions I begin with to Rick himself. For the purposes of this essay, I’m not as interested in choosing a Rick to support as much as I am in noting that Rick’s past is important for exposing who he really is. What interests me is the complex relationship of our past with the authentic identities we inhabit in a constantly changing present. I agree heartily that some stories or myths about our past are mutually exclusive. Some myths are better because they are more faithful to the empirical evidence and because they are compelling enough to give shape and direction to something as amorphous as a nation. The greatest danger are myths that are almost entirely disconnected from empirical evidence and supply a deracinated people with a manipulated account of their collective identity. In a way it’s pertinent to your analogy about the American identity too. The world of Rick’s Place, of the sophisticated American gentleman (note Rick’s coat and tie), traveling to Europe and foreign ports to chase her women and learn her ways, is long gone. The audience for that movie is vanishingly small, I’m sad to say. The assemblage I see sitting across from me on the train riding from Brooklyn to Manhattan in the morning is even less comprehending, were it to watch movies in English at all. This leaves no room for the more persuasive account of the failure of politics, as, for example, MacIntyre recently discussed. Woops — actually I didn’t mean to imply that you had. I might add, just in case, that I was not intending to direct those snarky bits at your post. I was, perhaps, veering off — while reading the first part of the essay, it just struck me that early-Ric v. Laslowfied-Ric might be seen as two competing visions of morality. The latter having, perhaps, the advantage of greater and more transcendent aspiration, but the former having the advantage of a sort of gruff, straightforward, and very personal approach to life. I’m thinking that the fact that the term “myth” has been stigmatized with negative connotation might bear on your thesis… vice the older conception of myth = “story”, which is neither necessarily positive or negative, and which can be true(r) or false(r). I.e., from the viewpoint of the typical American mind: *We* don’t have myths about the past … what we have is one-hunert percent scientifically-verified history. Just the facts, ma’am. Myths, now, those are what those *other* benighted folks have. An ideology is a myth that refuses to recognize itself as myth? Caleb, your brief comments send this conversation into deep waters. I, for one, would like to read an extended essay on the problem of politics in the context where a shared moral vision does not hold. As I see it, at least two interconnected issues are involved in your comments and in the essay you reference. The first concerns the degree to which a democracy can engage in politics–or, to put it a different way, how substantial, coherent and accepted must the moral vision of the electorate be to allow for deliberation? In what sense can we have a conversation about ends and means if we have no shared vision about ends? The second issue concerns the need for a shared vocabulary. Can we have a conversation if we don’t know what we all mean by the key words we use? Absent a truly shared vocabulary (not just shared words but shared meanings) we must assume that conversations are impossible. And I have to assume the more abstract the vocabulary the more elusive the politically relevant meanings. I have tried to suggest the importance of this second issue in this and other essays. Moreover, beyond the moral and linguistic structures of a meaningful political community, I wanted to add the historical or even genealogical nature of any national identity. These are all pressing problems for our nation, I believe. But to whatever degree that one might share my concern about this, are we to assume that a political conversation is impossible in America? Undesirable? Some might argue that we cannot expect an articulation of a moral vision, complete with shared vocabulary and rooted in a remembered past until we foster “conversations” rather that CONVERSATION–until, that is, we focus on politics on a scale that allows for communities to make progress in both the habits of self-government as well as the recovery of nearly-forgotten purposes. JD, I didn’t take your comments to be directed at my essay directly. Moreover, I agree that there is something much more compelling about the Rick we meet at first (the one we see in the picture associated with this essay). If we had met the later Rick first, he would have seen shallow and two-dimensional. But that is the stuff of a different essay. Ted, I have limited time just now, but I appreciate your response and do think that this puts us in deep waters, but waters which must be charted nonetheless. are relevant, as well as Jeremy’s earlier discussion of the loss of a culture. Ted: I didn’t mean to suggest that using an old black-and-white film favorite like Casablanca as the starting point for a conversation was futile and worthless in our time. You clearly understand the characters and story. Once you have set this up, where is the conversation? What are the topics, myths, teachable moments? We know we have permission to hold this conversation, and we have a pretty good idea of the parameters. What we need you to do is fill in some of the blanks in a real conversation with real issues and sides to take. Hudson, I’ll have to think about your comments a bit more before I know what I think. But my first reaction is that it is not clear that we know how to have a conversation. Caleb raises this issue above and I wrote this essay on the firm belief that in the US we are losing whatever democratic habits we had that would make possible meaningful communication about essentials. I wanted to insist on the historically grounded nature of any authentic identity while at the same time suggest that there is an openness and even a plasticity to our identity. Some of the dangers we face include that we will try to create some identity without resorting to our past as the primary resource out of which to mold an authentic expression of our selves. We must also worry, I think, that we have become so accustomed to declaring things that we’ve lost the necessary customs of compromise and deliberation. These problems are made much greater when we try to make all our serious political conversations in the context of national elections. So, while I do take sides on real issues and I do believe that some subjects should be front and center at this moment in our history, I want to begin with basics–the art of conversation and the importance of history in defining our national identity. Until we do this, we cannot have a conversation proper. It is my sense that we have only begun to explore the problem of “communication about essentials”–a subject that might send some of us back to Voegelin for help. Ted, briefly, don’t discount the value of elections in bringing out passionate discussion on national identity. I followed the Democratic primaries on NY Times’ blogs, commenting heavily, though not a Dem myself. One thing about the Times is they will print wildly divergent opinions, as they did during the Dem primaries, which split the party, pitting Hillary against Obama. Some of the best, most frank ponderings on race and gender in America I’ve read lit up the Times during those days. The pols may turn out to be crooks and charlatans, but the debate they stir up getting themselves elected is worth participating in and observing. Ted, Can we not also think of “Casablanca” as sappy sentimentalism? Rick, who moves from ideological nonsense (Spanish “loyalism, for goodness sake) to pointless capitalist cynicism and then to unexplainable love for a women who is, what, well, Ingrid Bergman, who cannot be imagined in this movie except on her back or with a halo. And then he becomes a martyr? Omigosh, I may have just become politically incorrect. This movie, I would suggest, is the ultimate progressive myth, which leads your very interesting parts II and III in slightly different directions. As a point of style, I suggest “mythos” be used in preference to “myth.” Less confusion that way. You know darn well that I’m a sentimentalist, though neither sappy nor progressive. Indeed, by insisting on the necessary historical and empirical grounding to any authentic identity, I’ve sought to limit the range of progressive redefinition of American identity. Of course for my essay the reason that Casablanca interests me is the way it builds in the theme of a historically rooted identity and the foolish attempt to deny its hold on the person. What I expected would provoke much more debate was the degree to which I was willing to allow for the refreshed and idealistic Rick to be an authentic American identity, and I wonder if that isn’t part of your concern. And yet in the context of 1942, the “propaganda” of Casablanca struck a very real American cord. I have real concerns about the way WWII (to say nothing of WWI and the “war” against the Depression) narrowed the range of American self-understanding by highlighting a crusading spirit that required a consolidated nation and enlightened federal government. In a small way, I wish to encourage a more comprehensive review of our history that will allow older sources of American identity to come into fresh focus in our time. There are a few things I have learned in my life, and two of them are: If you really, really like Ralph Waldo Emerson, or if you think that the Spanish “republicans” were right, you can’t be all good. The latter was what put me onto Rick in the first place. And I think that Ingrid Bergman was an Emersonian, at least in this movie. This conviction of course leads me to deny completely the “crusading spirit that required a consolidated nation and enlightened federal government,” which gets us back on the same page. Unless of course if you want to argue that the USA is a propositional entity, and I am pretty sure you don’t. Casablanca premiered Nov.26,1942, Allies invaded Morocco (Casablanca), Nov.8,1942. So, lots of free publicity. in a world gone wrong he blends in with his internal Pain that he never discuses but it nonetheless exists. his vulnerability only exposed in tragic Love, that breaks him like glass over a rocky cliff.. his loyalty’s are deep and strong.. his punishment for his life’s sins are always before him. he wears them like a badge of honor. the thing that drives him is survival., adventure, pain, and Love, and friendship. he was a Mercenary, so he has killed men. for money. but he still struggled against the tougher opponent with a glimmer of hope for the weaker side. the complexities that make up Richard Blaine are what make us admire him so much, and these characteristics are why Ilsa Loved him so much. it’s a comical tragic Love story with a romeo and Juliet type of quality, war my be romanticized but when u have a Love affair during a world war, it is more intense and volatile than most Love stories. and through it all. even Hollywood cannot escape the ugliness of the world by referring to Ricks Loyal friend and companion as “THE BOY WHO’S PLAYING THE PIANO” the real world meet’s the screen world in another classic Art imitates life and vice versa. story. Rick you are me, i am you , you are the “cool” that men aspire to be but are to cowardly to attempt to live a life like yours. vulnerable to a fault, too tough for your own good. human frail, strong. glorious. a Man… a human soul trapped in a fleshly form walking around in this earth trying to make sense of it. and making it fun to watch for us lesser mortals. we all would have been be dazzled by Ilsa and her charms. but she found you.